Courtesy of Jaimie Monahan, Lac Léman, California. Inaugural LGSA Classic Swim from Switzerland to France After three years of organizing 70 km solo and relay challenges across Lac Léman, Ben Barham, Tim Davies, and Charlie Masding of the Lake Geneva Swim Association (LGSA) launched a new event to close its summer season on the lake that borders Switzerland and France. 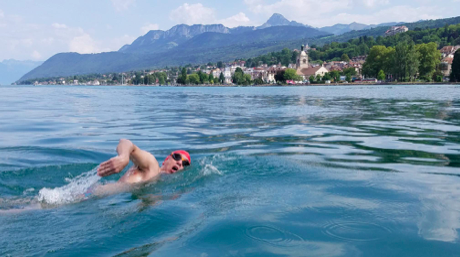 Re-establishing an international competition that was part of the FINA World Cup circuit in the 1990's, the LGSA Classic is a beautiful 12 km cross-border swim across Lac Léman from Lausanne to Évian-les-Bains, crossing the Swiss border into France. Following in the footsteps of renowned professional swimmers like Shelley Taylor-Smith (site of her first world championship title), the Classic is a great test for those wanting a real bite into the world of marathon swimming. On August 26th, 16 pioneers plunged into the pristine waters near Camping de Vidy in Lausanne on the Swiss side of Lac Leman. 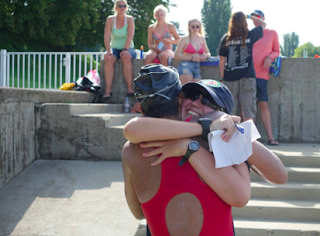 The return of the swim was seemingly welcomed by Mother Nature as she rewarded the organizers and swimmers with sunny clear skies, air temperatures of 29°C (84°F) and water temperatures averaging 22°C (72°F). The first finishers were Martyn Webster and Nuala Muir-Cochrane, who, interestingly, swam together at grammar school years ago, but had not seen each other since.